VANCOUVER, BRITISH COLUMBIA--(Marketwired - July 27, 2017) - First Mining Finance Corp. (TSX:FF)(OTCQX:FFMGF)(FRANKFURT:FMG) ("First Mining" or the "Company") is pleased to announce the sixth set of assay results, comprising 14 drill holes (Tables 1 and 2) from its Phase 1, 24,300 metre diamond drill infill program on its 100% owned Goldlund Gold Project ("Goldlund"), located near the town of Sioux Lookout in northwestern Ontario, Canada. Note: Assaying for the Goldlund 2017 drill program is being done by SGS at their laboratories in Red Lake, ONT, and Burnaby, BC. Reported widths are drilled core lengths; true widths are unknown at this time. Assay values are uncut. 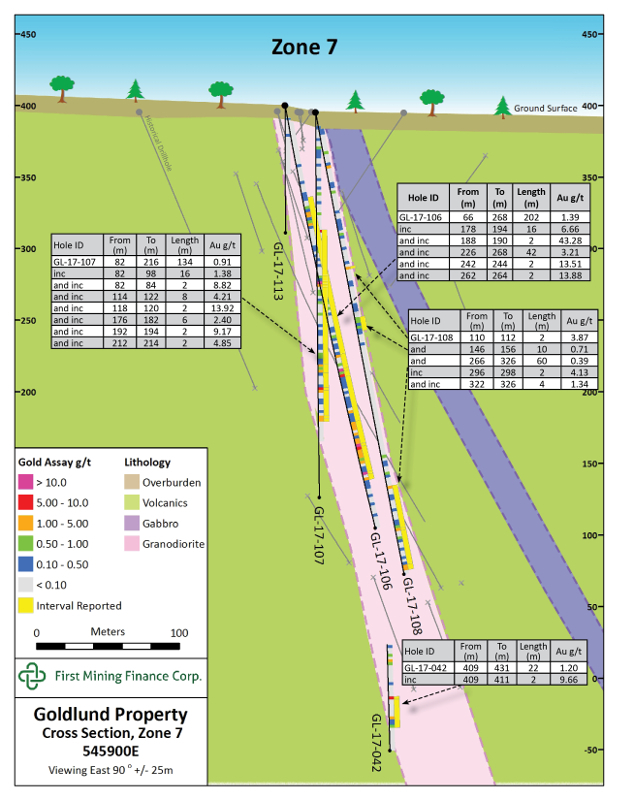 The primary goal of the 2017 drilling campaign at Goldlund is to upgrade Inferred resources into the Measured and Indicated categories, with the majority of the drilling focused on Zone 7 and Zone 1 (Figures 1 and 2), and to gain further knowledge of the geology and gold mineralization in preparation for a Phase 2 drilling program. The Phase 1 drilling program, comprising 100 holes (24,300 metres), was completed at the end of May and the remaining assay results from the Phase 1 program will continue to be released in batches as they are received. Since the commencement in January of the Phase 1 drilling program, the Company has issued five press releases (on April 25, May 2, May 24, June 20 and July 10, 2017) comprising a total of 60 drill hole results. With today's latest press release, the Company has now released the results for 74 drill holes from the Phase 1 program, of which 69 drill holes contain significant intervals of gold mineralization, a 93% success rate. Commenting on the results, Patrick Donnelly, President of First Mining stated, "As our drilling program continues at Goldlund we keep hitting very encouraging intersections of gold mineralization which supports our view that the Goldlund project is amenable to bulk mining methods. Furthermore, once we complete the Phase 2 drilling campaign currently underway at Goldlund, and receive the remaining assay results, we will commence work on a new NI 43-101 mineral resource estimate for Goldlund." In addition, Keith Neumeyer, the Chairman of First Mining, stated, "The latest results from the Goldlund program reaffirm our decision to move forward in drilling and de-risking this asset which we believe will add organic value to the Company and our shareholders. I look forward to seeing the Phase 2 drilling results later this year as it will move the focus away from infill drilling and towards pure exploration targets at this large project. This has the potential to provide further upside to future project economics and I continue to gain confidence that Goldlund will become one of our flagship assets." more intense quartz stockworking and potassic alteration. 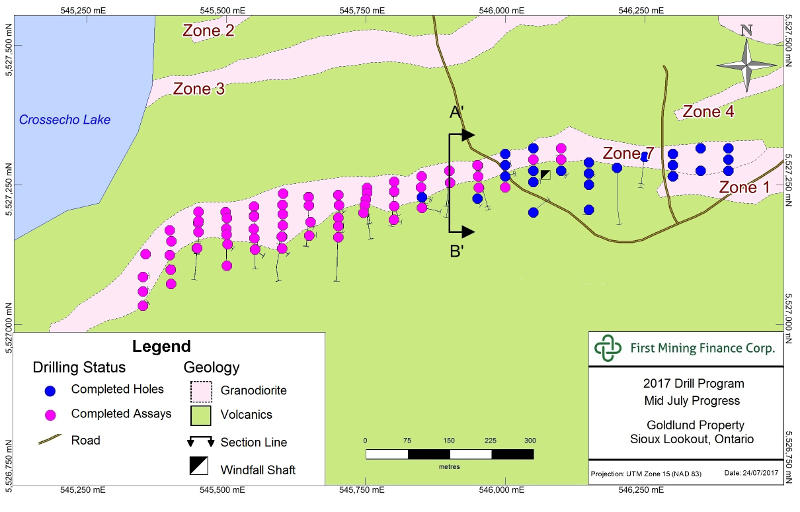 Figure 2 above displays a cross- section of the geology and gold mineralization with drill holes GL-17-042, GL-17-106 to GL-17- 108, and GL-17-113. United States securities legislation including the United States Private Securities Litigation Reform Act of 1995. All statements, other than statements of historical fact, included herein, without limitation, statements relating the future operating or financial performance of the Company, are forward-looking statements. Forward-looking statements in this news release relate to, among other things: the potential results of the remainder of the Company's Phase 1 drilling program at Goldlund and the timing of the dissemination of such results by the Company; the views of the Company that the Goldlund project is amenable to bulk mining methods, completion of the Phase 2 drilling program, preparation of a new 43-101 mineral resource estimate for the Goldlund project and the timing for the completion of such a resource estimate, the potential for the Phase 1 and Phase 2 drilling programs to provide further upside to future project economics at the Goldlund project; any upgrade to, or expansion of, the resources on the Goldlund project; and the potential for further value to be unlocked at the project. There can be no assurance that such statements will prove to be accurate, and actual results and future events could differ materially from those anticipated in such statements. Forward-looking statements reflect the beliefs, opinions and projections on the date the statements are made and are based upon a number of assumptions and estimates that, while considered reasonable by the respective parties, are inherently subject to significant business, economic, competitive, political and social uncertainties and contingencies. Many factors, both known and unknown, could cause actual results, performance or achievements to be materially different from the results, performance or achievements that are or may be expressed or implied by such forward- looking statements and the parties have made assumptions and estimates based on or related to many of these factors. Such factors include, without limitation, the results of future exploration efforts at the Goldlund project; management's discretion to refocus its exploration efforts; fluctuations in the spot and forward price of gold, silver, base metals or certain other commodities; fluctuations in the currency markets (such as the Canadian dollar versus the U.S. dollar); changes in national and local government, legislation, taxation, controls, regulations and political or economic developments; risks and hazards associated with the business of mineral exploration, development and mining (including environmental hazards, industrial accidents, unusual or unexpected formations, pressures, cave-ins and flooding); the presence of laws and regulations that may impose restrictions on mining; employee relations; relationships with and claims by local communities and indigenous populations; availability and increasing costs associated with mining inputs and labour; the speculative nature of mineral exploration and development; and title to properties. Readers should not place undue reliance on the forward-looking statements and information contained in this news release concerning these times. Except as required by law, First Mining does not assume any obligation to update the forward-looking statements of beliefs, opinions, projections, or other factors, should they change, except as required by law.